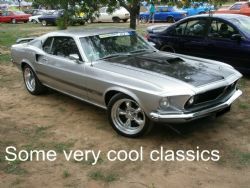 I had heard the stories and read the articles so I thought it was about time I exposed myself to the danger of dust and smoke filled nostrils and had my senses berated with the sounds of big blocks, burnouts and cool cars. 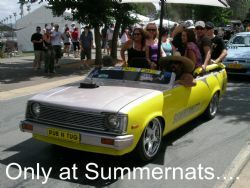 I am talking about Summernats 21, held at Exhibition Park in Mitchell, Canberra each January. The decision was made to do it, I grabbed a mate, loaded the car with the hat, sunscreen and mandatory shades and headed off from Sydney. I expected the boys in blue to be out in force on the Hume Highway revenue raising, um, I mean maintaining traffic policy but to our surprise we never sighted one on the journey down. Coming from Sydney it is really easy to find as Mitchell is one of the first suburbs you come to. A blind man couldn’t miss the enormous car park, situated on the right hand side of the highway. In we go, not really knowing what to expect. The first thing that strikes you is the staff and security who point you towards the ticket stand. At $44 entry for the day it wouldn’t rate as cheap and having arrived first thing in the morning we thought we may be done and dusted by midday and on our way home. After getting a wristband and having a mandatory loo stop after the drive you come to the outer perimeter road where all and sundry cruise past in their street machines, hot rods and classics. I could have stood here for a couple of hours and watched the world go by, but greater temptations lay inside. The first shed we came to contained the dyno with a large crowd watching an assortment of tricked up machinery trying to outdo each other in the horsepower quest. There were two dyno stations with big screens showing the results for all to see and a subtle sign suggesting earplugs should be worn. They were right. After getting the sound sense warmed up it was time to venture further. Strolling down a track littered with vendors catering for every food taste imaginable we noticed a queue of cars lining up for the go to whoa event. Here again was an assortment of some outstanding cars from the early 30’s right through to current models found in the showrooms across Australia. 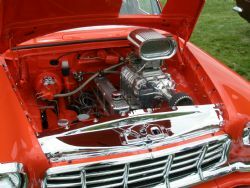 Of course nothing was presented as the manufacturer originally intended and the modifications ranged from mild to wild. 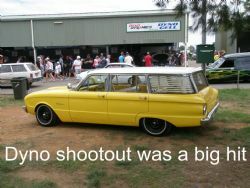 One car that caught my attention was a beautiful Holden EH in the same colour as one my father bought new in 1964. This one looked stock, bar the wheels but nothing could camouflage the five litre V8 and five speed gearbox residing between the chassis rails. The car had apparently been done up twelve years ago, driven regularly and appeared to have just come out of the workshop. A massive grandstand made from concreter’s form work, complete with concrete still attached was erected as seating. With go to whoa it is all about the quickest time between two points with the real art of being able to pull your car up between two white lines at the end of the course. Miss the whoa, no score recorded. Laughter erupted as a tiny Fiat graced the line and even though it looked like it wouldn’t pull the skin off a rice pudding the time put down left a lot of the big block behemoths red faced. This is more about driving skill, braking and nailing the finish than brute horsepower. A little blown Mazda had the crowd on its feet with a massive burnout on the line that blanketed the entire grandstand in smoke. I was standing about five meters away from it and was backing away thinking something is going to let go and I would be showered with grenade like particles of metal. Thankfully that didn’t happen. The run was as spectacular with traction only being achieved under brakes at the end of the course. By this stage the sun was out and being a bit too aggressive so we headed off looking for shade and more bling. There is an oval in the middle of Exhibition Park that contained more eye candy with lines of cool cars basking in the sun for all to enjoy and get up close and personal with. Vendors with all sorts of car related stuff filled halls and you never had to walk more than twenty meters if you wanted a neck oil, stomach filler or ice cream. Management had set up two tiered seating along the main cruising route and you could literally sit here all day and watch the procession of owners cruising by showing off their cars, girlfriends and themselves. This is not an event for the shy and retiring type, rather an in your face horsepower and petrol head heaven run with a good mix of safety and fun for everyone. There were other halls with show cars and Meguiars were taking the wraps off the coolest of these later in the day. Along the cruising route clubs, groups and mates had set up massive tents complete with lounges, fridges and all the creature comforts required for roughing it Summernats style. Hours were spent ogling the machinery, not to mention the babes promoting various products roaming through the crowds. Everywhere you went there was something to see, do or checkout and time passes quickly with so many distractions. The burnout competition started later in the afternoon and just in case your senses hadn’t been assaulted enough you could sit in the grandstand or the grassy hill on the opposite side of the track and taste the rubber particles on your lips while struggling for vision through a cloud of dense smoke. We left late in the afternoon, all senses satisfied. The perceptions were beaten by the reality – this event was far better than I imagined with everyone there in good spirits and having fun. It really is a petrol head party done in good taste with a well behaved crowd all enjoying the moment, cool cars and summer in Canberra.